RPC-114 as recovered after Incident 114-13, deceased. Containment Protocols: RPC-114 is to be housed in a specifically designed self-sterilizing humanoid containment cell located in OL-Site-059. No living plant life is to be brought into OL-Site-059. Due to the nature of the other anomalies stored on-site, no conventional weaponry is to be used or stocked. The current condition of RPC-144 renders this acceptable. Description: RPC-114 is currently a male humanoid entity of indeterminate age and nationality, measuring approximately 165 cm tall. The lower body of RPC-114 tapers off into the haunches of a Cervus elaphus1, with antlers from the corresponding species growing from the forehead during the spring months2 and shedding during the winter. RPC-144 has no requirements for sustenance, and does not appear to undergo biological processes such as defecation or sleeping, although it is capable of being injured, and will recover at a rate analogous to that of humans. RPC-114 speaks all known Celtic languages fluently, and is capable of communication in a form of broken English, but has actively refused any attempt at communication from Authority personnel. The physical condition and resilience of RPC-114 directly corresponds to the amount of plant life present within a 2 km radius of it’s position. While there does not appear to be a concrete way to quantify this effect, the physical condition of RPC-114 scales with the amount of plant life in the area, with RPC-114 having significantly expanded muscle mass and athletic abilities when in heavily wooded locations, and current containment procedures reducing the entity to an emaciated and physically withered state analogous to starvation. Discovery: RPC-114 was initially encountered after surviving members from a Church of Malthus sect contacted the Authority directly, claiming to have summoned the entity intentionally but misunderstood key elements of the ritual, particularly mistranslating the required offering as “a meal of deer” rather than “a meal for deer”. Dispatched agents initially had significant trouble engaging with the entity, before a misfired weapon initiated a forest fire which burnt away much of the foliage in the immediate area, weakening RPC-114 to a level as such as to be subdued. Incident 114-13: Following an unrelated containment breach of OL-Site-059 on 23/1/2016, the containment cell of RPC-114 was damaged enough for the entity to escape through a damaged wall. Security footage captured RPC-114 fleeing the location in a desperate rush, impeded heavily by its emaciated state. RPC-114 was found deceased twelve hours later, having run approximately 12km away from OL-Site-059, with no discernible change in physical state. 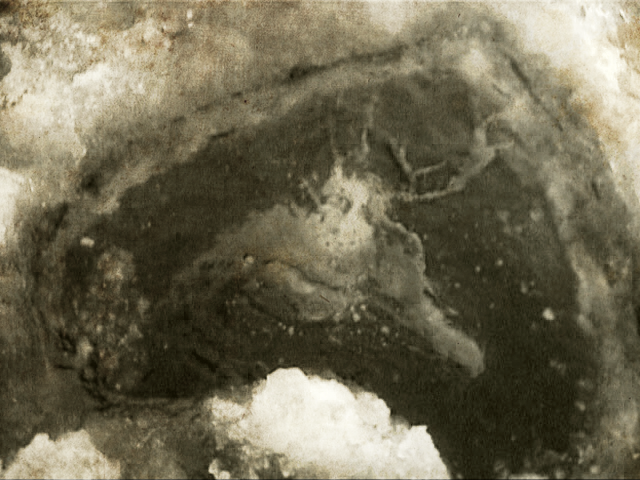 The entity appears to have fallen through a weakened ice sheet and, due to sheer physical exhaustion, become unable to escape before drowning. Subsequent autopsy found a lack of any internal organs beyond lungs and a stomach, with the corpse otherwise no longer exhibiting any anomalous traits. Update of object class to Neutralized has subsequently been granted. Incident 114-14: Shortly after the autopsy of RPC-114, an unknown entity was encountered within OL-Site-059, attempting to collect the remains. Once on-site security personnel responded to the entity’s presence, it fled with a single antler. Security footage of the event appears to show the entity manifesting within the morgue of OL-Site-059 and becoming significantly distressed at the sight of RPC-114’s remains. Following this event, cremation of the remaining cadaver has been authorized.